Like its title vegetation, Alain Resnais’s Wild Grass has a free-sprouting nature, unaffected in manner and developing as it will, and as such has too little self-regard to be one of those movies about movie love. The work of an 87-year-old who has enjoyed a rich life making films, and has enriched the world immeasurably by making film history, it can afford to take its own condition as cinema for granted and concentrate on other matters: the difficult calculations involved in buying satisfactory shoes, for example, or the touching failure of dentists to establish a reassuring ambience in their offices. Mostly the film focuses on a blind flirtation–or rather a blind hope for flirtation–or, no, a blind refusal of flirtation, as played out in the nicer suburbs of Paris between two people who are old enough to know better. Resnais’s theme, in other words, is the capacity for human desire, unprompted, to leap toward the skies, and in leaping to trip over its feet. And so, even though Wild Grass is utterly nonchalant about its status as a movie, it makes sense that the two main characters, full of beautifully evanescent fantasy, should finally meet outside a movie theater. The events that lead them to this meeting are simple to relate, though also as unruly as the grass that springs through cracks in the pavement. Marguerite Muir (Sabine Azéma), a woman with challenging feet, goes to the Rue de Rivoli to buy shoes. After bringing a wanly smiling clerk close to exhaustion, she exits the shop with her purchase (which is identical to the pair she was wearing) and falls victim to a purse snatcher. For reasons Marguerite may not understand, or even try to articulate to herself, she does not report the theft; but within hours, her discarded wallet is discovered in the parking garage of a shopping center miles from the Rue de Rivoli. Georges Palet (André Dussollier) sees it lying next to a tire of his car, reaches down for it, stops and then completes the circuit of chance by picking it up. Why did he hesitate? He might not know; but he is quick to articulate to himself an impression of the owner, based on the tantalizing scraps of information in the wallet. He will hand it in to the police, of course. He must. But first, shouldn’t he call Marguerite Muir? How should the conversation go? An impetuous man, outwardly shambling, settled and middle-aged but inwardly buffeted by an uncontrollable imagination, thinks he has encountered, or ought to encounter, a not-quite-unknown woman. The woman, who is literally flighty in her instincts (by avocation, she’s a pilot), is nevertheless indecisive by nature and grounded by a timidity that keeps her, in her middle years, describable as pert. She has a cloud of bright red hair and a flared, piped, double-breasted coat that makes her look like the Little Prince; but day by day she works behind a white mask in her dental office, where the one pathetic hint of expansiveness is the blue-sky pattern of her wallpaper. As for Georges, he is a man with a good car, an excellently furnished house and a fine-featured, cultivated, infinitely solicitous wife at least a dozen years his junior; and yet for some time he has been stalking about like Lemmy Caution, with security guards following him with their eyes, ominous music welling up behind him and thoughts proper to a desperate ex-convict growling through his mind. Perhaps retired, perhaps laid off, he has no job, other than to follow his wife’s instructions about caring for the house; but he could be said to be employed as a writer, once he begins a campaign to make himself known to Marguerite. Working at a red typewriter, he composes copious letters full of autobiographical revelations, some of which might even be true. She studiously avoids response–although, as she’s told the police with fluttering curiosity, she would like to know something about the man who returned her wallet. It’s only natural. The outline of these events, I should point out, was decided not by Resnais and his screenwriters (Alex Réval and Laurent Herbiet) but by the author Christian Gailly in his novel L’Incident, which served as the source for the film. More than a trace of Gailly’s language has been retained, thanks to a voiceover narration recited confidingly, but with engagingly modest doublings-back and ellipses, by Edouard Baer. The Little Prince and Lemmy Caution do not figure in it; nor do any number of other details that seem highly relevant, without their actually having much to do with moving along the plot. These purely cinematic touches would include the perfect roundness of Sabine Azéma’s eyes, which convey many emotions, but always as one mode or another of being startled; and the jutting ridge of André Dussollier’s lower teeth, which are continually exposed by his pulling back the corners of his lips, as if the entire world were a hot stove top that he kept brushing against. If Wild Grass achieves a perfect tone of droll melancholy, rather than being what a mere plot synopsis would imply–the creepy story of a stalker and his victim or the heartless, madcap recounting of the pratfalls of two fools–it’s largely because the baffled dignity in these faces imparts such sympathy, sorrow, warmth and subtle humor to Georges and Marguerite. And if Wild Grass also achieves an appearance of being natural (like Marguerite’s curiosity), it’s because of the similarly extra-literary contributions of Resnais. I don’t know when I last saw a film directed with such complete freedom–freedom even from ostentation about the director’s mastery. You sense that all of the resources of cinema are available to Resnais at any moment; that he can make faces suddenly pop out of any part of the screen he likes, make time run in reverse, let his camera wander off to incidental points of interest, change the characters’ costumes or the time of day right before your eyes. Everything seems possible–even flight, which may be a dream to Georges and a long-abandoned pleasure to Marguerite but is always an option for Resnais, whose point of view glides down from heaven or floats up to the sky as the mood takes him. This is artifice, all right, but of the sort that has become second nature to the old artificer; virtuosity, but of the sort that escapes both the constraints of gravity and the shackles of the virtuoso’s desire to prove himself. In Wild Grass, Resnais puts his art entirely at the service of his characters and their preposterous, thoroughly human situation. And so, in his own time, Resnais brings them together, not for the sake of the movies but (appropriately enough) at a movie theater: the sort of revival house you find tucked away on the side streets of Paris, in midblock. From the sidewalk, a red carpet grandly ascends four little steps. At their summit stretches a portal that comprises gleaming red doors, each barely wide enough to admit people in single file. Topping the facade, the word Cinéma in neon script blazes in the night, just above a marquee low enough to smack your head. Expectation and its disappointment, combined in a single piece of vernacular architecture: this is the view from the cafe across the street, where a woman with a cloud of red hair watches impatiently for the last show to let out. She knows this theater is about to release her fate–which is to say, a man she has not yet seen but is sure she’ll recognize. She has found out that he’ll be here, alone and miles from home approaching midnight; and she knows he’s been dreaming of her, a woman he knows only as an ID photo and a voice on the telephone. Wild Grass had its US premiere in late September at the New York Film Festival, where it had been chosen to serve as the opening-night feature–a distinction that always has at least the potential to seem symbolic to American cinephiles. And who, exactly, is a cinephile? You could say it’s someone who would use that word; or, in a better mood, you might say it’s anyone who would like to think of film not just as commerce and entertainment but as art. Wild Grass put the cinephile now writing into the best of moods. For one night, at least, art had triumphed, which is symbolism enough. 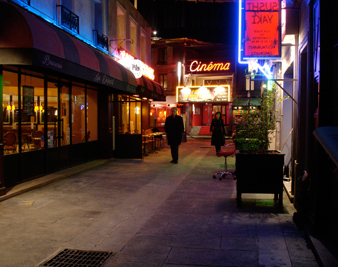 But if more is needed, it can be found in the participation in Wild Grass of longtime Resnais collaborators such as Azéma and Dussollier but also of extraordinary members of a younger French generation: actors Mathieu Amalric, Anne Consigny and Emmanuelle Devos and cinematographer Eric Gautier. Now they, too, are part of the Resnais tradition, and can pass it on for years to come. To ask for still more symbolism would be to let desire overleap. It’s enough to say that you, cinephile, can look forward to a regular theatrical release of Wild Grass in 2010. If you should become impatient, you might make use of the time by preparing yourself at a traveling Resnais retrospective, which is on view in Los Angeles and will soon be showing up in Chicago, Berkeley, Madison, Columbus, Cambridge and Houston. For information on the retrospective, visit frenchculture.org. For a good time: call on Wild Grass. In 1959, at the Cannes festival, Resnais’s Hiroshima, mon amour shared the International Critics’ Prize with a picture titled Araya: the work of a 32-year-old Venezuelan named Margot Benacerraf, who resisted having her film categorized as a documentary, preferring to think of it as a poem. Resnais’s uncategorizable film, of course, went on to astonish, puzzle and bother the hell out of audiences around the world, and has remained in circulation in one form or another ever since. Araya all but disappeared. It waited until 1967 to receive distribution in France, premiered in Venezuela in 1977 and emerged in the United States only briefly in 1987, as part of the traveling series “Latin American Visions.” Although Benacerraf had gone on to establish Venezuela’s Cineteca Nacional, Araya seemed destined to be one of those legendary films found only in books. This situation changed on October 7, when Milestone Film and Video began the US theatrical release of its wonderfully restored print of Araya. Set on a barren peninsula in northern Venezuela, Araya begins with an invocation of the elements: tall, brooding masses of clouds, onslaughts of glistening waves, terrifying expanses of hills and ravines that appear to be purely mineral, without any trace of life. The black-and-white images, by cinematographer Giuseppe Nisoli, seem overpoweringly elemental themselves, with their dazzling tonal contrasts; and the atonal music by Guy Bernard, composed in the dated yet strangely compelling style of marimba modernism, adds to the sense of an encounter with something at once earthly and alien. A brief history lesson follows, narrated in voiceover: the story of the Spanish discovery, early in the sixteenth century, of the vast salt marsh at Araya and the exploitation of this valuable resource. And once the Spanish left, the narrator asks, and their fortress fell into ruin, what became of the people who mined the salt? The answer comes in the form of a crane shot, which rises over a huge white pyramid to reveal lines of men stretching from the foreground down to the distant edge of the sea. Naked to their waists, and with baskets on their heads, they follow one another from the shore to the top of the pyramid and back down again, carrying loads of salt and dumping them over and over and over. Nothing has changed, the narrator intones, for 450 years. From this point on, Araya is a synthesis of one day in the unvarying lives of these people: a family of salt haulers who work on the beach; another family that digs salt out of the shallows; and a third family that fishes for a living, providing the salt miners with their only source of food. I can compare the film only to Luchino Visconti’s great La Terra Trema for its combination of extraordinary beauty, outraged social conscience and almost mythic grandeur–with the exception that Araya is about a reality even more harsh, more pitiless and more doomed. The experience was stunning in 1959. It’s every bit as stunning today.